John Lennon purchased a new Gibson Les Paul Junior with a tobacco sunburst finish sometime in the early 1970’s. Lennon took his Les Paul to New York luthier Ron DeMarino to be modified. 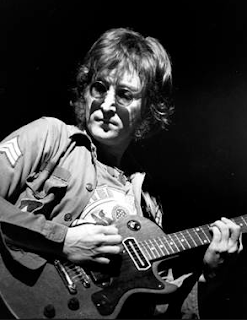 Lennon suggested that he would like DeMarino to install a humbucker pickup. Instead of the requested humbucker, DeMarino installed a "Charlie Christian" pickup, which had a narrow string-sensing blade and produced a clear sound. Lennon later returned the instrument to DeMarino and asked him to sand off the sunburst finish to a bare mahogany wood finish.